Are corner portfolios still tested on the CFA Level 3 exam? The answer is probably not directly in the same way that it was been consistently for years. It is much safer to ignore the material now than previously. The coverage in the underlying material is relegated to passing references, one "blue box" example, and a footnote that contains much of the previous material. But there is STILL a good reason to know the concept as a Level 3 candidate even if perhaps the specific calculation that was so popular is gone. 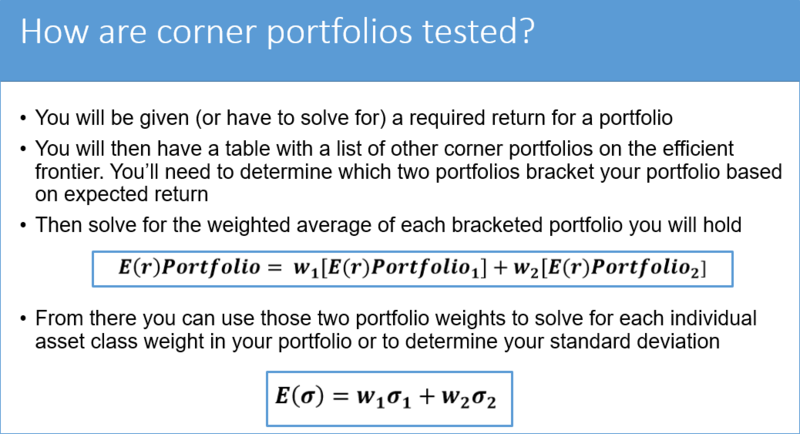 How specifically do corner portfolios actually show up in the CFA curriculum? To get more granular, the 2018 CFA L3 curriculum continues to (1) not be super explicit about corner portfolios and (2) both mentions them several times and has a 'blue box' example around "a strategic asset allocation based on distinguishing a nominal risk-free asset. This entire blue box problem is a sh*ttier way of presenting elements of what was previously tested via a more robust corner portfolio problem honestly. In the explicit blue box eample it becomes clear that you still need to know about the tangency portfolio and how to identify it. That said the fact that this exhibit puts much of the definition of a corner portfolio into the footnote on that reading is probably a sign that it is unlikely to be directly tested, and certainly not directly tested in the same way as in previous years. The idea/concept and coverage of corner portfolios still does a good job pulling multiple concepts together that are still highly testable. 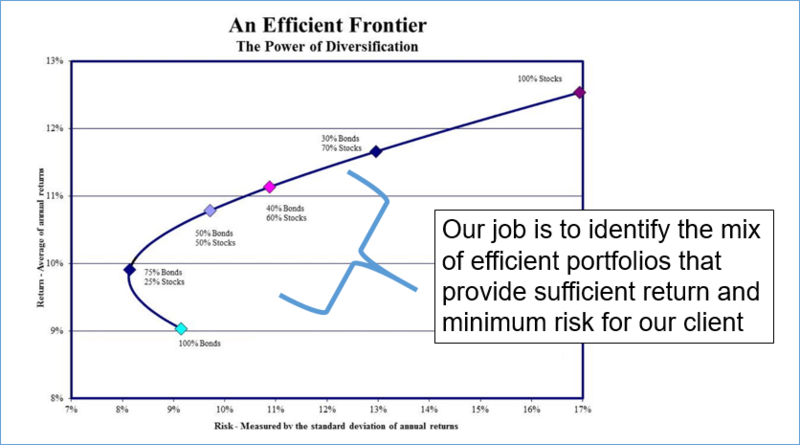 Understanding conceptual frameworks like the global minimum variance portfolio - This links to the whole idea referenced in the Asset Allocation readings that corner portfolios are those that exist along efficient frontiers. It goes on to say that this is something that we can leverage as asset managers to help our clients create efficient portfolios blah blah blah. They are a good way to understand the idea of combining the risk free asset + risky portfolio etc. Again, less likely to be directly tested from 2018 onwards, but the below post is still very much worth a skim. The good news? The math is straightforward and with practice you should be able to solve these questions quickly and accurately to save time while scoring maximum points. See Question 4 on the 2008 exam for a prime example. Before we define corner portfolios and jump into how to solve them for level 3, it's probably helpful to take a step back first. The above diagram should be familiar. It shows an efficient frontier and a tangency portfolio(the optimal portfolio) on the capital allocation line and the efficient frontier. 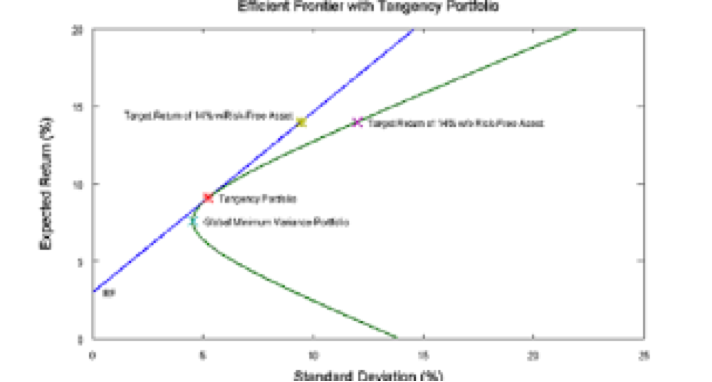 This tangency portfolio represents sort of the market portfolio. 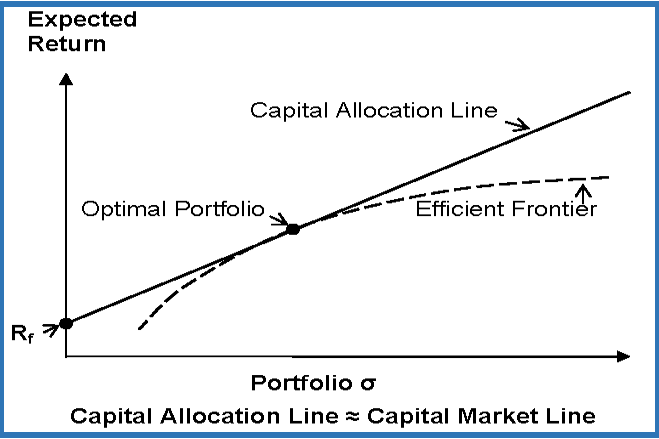 Remember that the market portfolio represents our most efficient option (remember diversification is beneficial and doesn't cost us anything, at least from the perspective of the CFA curriculum). So our job as an asset manager or portfolio manager is to look at our client's situation and help them select a specified return that's compatible with their risk parameters (the amount of standard deviation they can allow). Thus as we move along the efficient frontier we're making a series of trade-offs in order to find a portfolio that meets our client's criteria using asset class returns, standard deviations, and correlations (remember capital market expectations?). 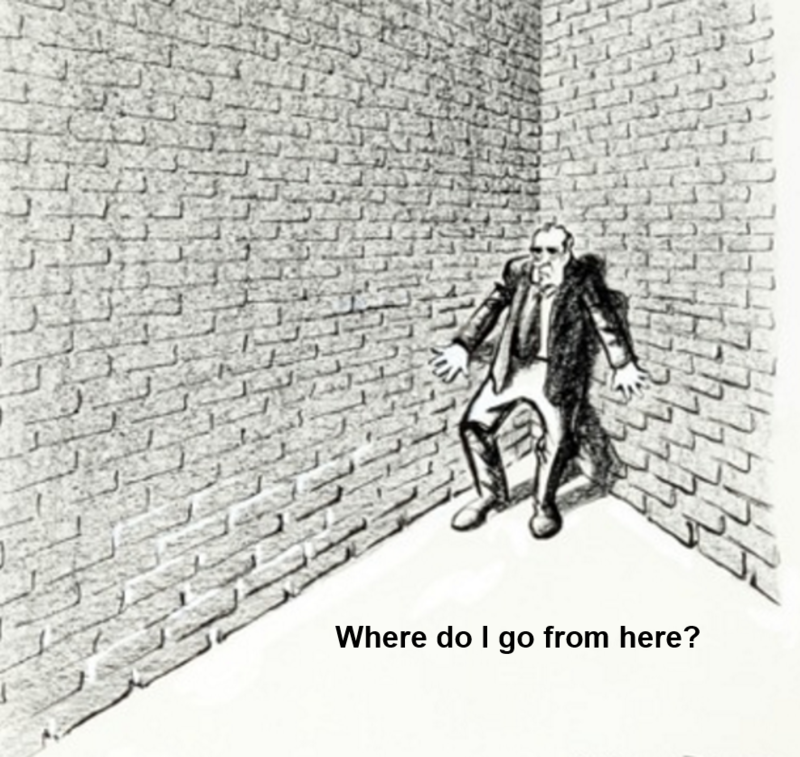 Corner portfolios are simply a variation of this problem where we are operating under more rigid assumptions. What is a corner portfolio? Corner portfolios arise in scenarios of constrained optimization. This means there are constraints imposed on the portfolio, most notably that short selling is not allowed. So any given asset classes can only have a weighting between 0-100%. This constraint means we're dealing with a finite set of portfolios on the efficient frontier. This is in stark contrast to a scenario where you CAN short sell or borrow. If this is introduced on the L3 exam then you just short the risk-free asset, or the treasury security, which essentially means you're borrowing cash, and you can use that cash to buy more and more of the market portfolio, which is the portfolio with the highest Sharpe ratio. 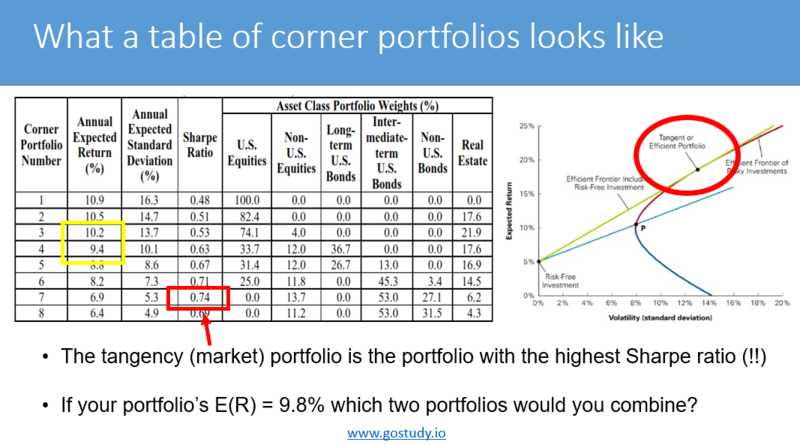 If you have a portfolio that lies in between two of these efficient corner portfolios then you can solve for that unknown middle portfolio’s expected return by taking a weighted average of the expected return of those adjacent corner portfolios. The same is true for solving for the standard deviation. Note the standard deviation you actually solve for will be slightly overstated. For the quants out there, corner portfolios gets around having to use calculus and solving for partial derivatives by assuming that any given small section of the efficient frontier is actually a straight line. Now let's say you are given a situation on the exam in which a client wants an expected return of 11% and a standard deviation no higher than 11% as well. We can assume that the portfolio will be in between those two portfolios and all we have to do then is solve for the unknown or middle portfolio's expected return. We that by taking a weighted average of the expected return of those two adjacent corner portfolios. Note that the tangency portfolio is the portfolio with the highest Sharpe ratio. It’s the portfolio closest to the market portfolio and the exam will often ask you to identify it. If the required return of your portfolio is lower than the expected return of the tangency portfolio than you can invest in a combination of the tangency portfolio and the risk free asset. On the exam, however, this is unlikely to happen because the expected return of the tangency portfolio will be too low and there will be a constraint against borrowing. Basically, if you can borrow and leverage to invest in the market portfolio (on the CML) you would. If you can’t, then you invest in a combination of portfolios on the efficient frontier that meet your required return while not violating your constraints (most notable of which is that they don’t exceed a required level of standard deviation). Let’s solidify this with a straightforward example. Say your required return is 8% and there are two corner portfolios, P1 with a 10% expected return and P2 with a 7% expected return respectively. Both P1 and P2 have different weightings of Asset A, B, C, and D. You can then solve for the amount of each portfolio, P1 and P2, you hold such that. w1(10%) + (1-w1)(7%) = 8%. Once you have the correct weightings—in this case 33.33% of P1 and 66.67% of P2—you can then apply those percentages to determine the weights of Asset Class A,B,C,D that you are holding in your portfolio. So say P1 had 10% in equities and P2 had 20%. Your new combined portfolio would have (.333*10%) + (.667*20%) weight of equities. To test whether this portfolio is suitable given your constraints you then check that its standard deviation (also a weighted average of the standard deviations of P1 and P2) is less than the maximum tolerable standard deviation. In a scenario with short selling you could just short the risk free asset (borrow cash) and buy more of the market portfolio with the highest Sharpe ratio. The standard deviation you solve for assumes that the corner portfolios are perfectly correlated. 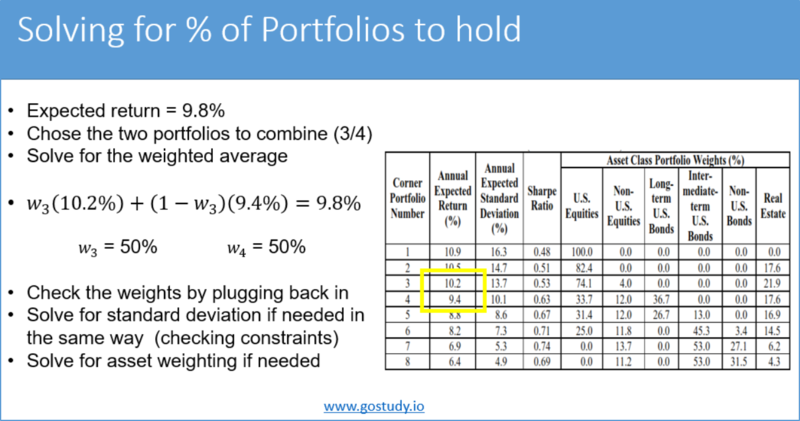 Hence the standard deviation you solve for is actually the maximum possible standard deviation of the portfolio. In these problems we're assuming that there's a positive linear combination between these two portfolios, so there's a standard rate of change of assets. And if you're more sort of quantitatively oriented, we're essentially getting around having to use calculus and solving for partial derivatives simply by assuming that any given small section of the efficient frontier is actually straight-line. Basically, if you zoom in far enough on a curve what you see is a straight line. Here too you would solve a simple weighted average equation with the weight attached to the risk free asset being negative. For a great refresher on CAL, CML, and SML see http://financialexamhelp123.com/cal-vs-cml-vs-sml/.